I served a six-month “term” (or “sentence,” in some cases!) as a Food Service Aide in an elementary school. YES, Glamorous JOANIE was a LUNCH LADY!!! And you know what? It was my favorite job ever! 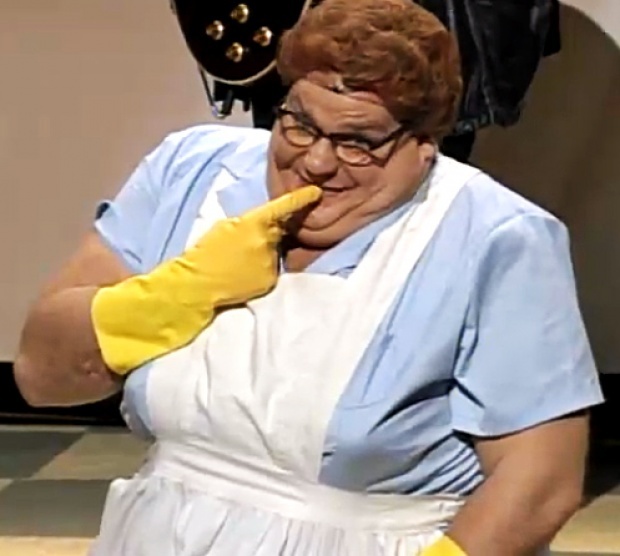 Once you get past the weird smells, unpleasant kitchen co-workers, ridiculous rules, loud clanging noises and insufferable heat, being a Lunch Lady ain’t half bad! Here’s why: imagine being the ONLY person in a child’s school day who is there simply to pleasantly provide a service with no expectations beyond basic courtesy. This truth is every Lunch Lady’s secret weapon, but we don’t all use this super power to its maximum potential. During my six month hiatus from the adult world working as an elementary school lunch lady, I met all kinds of lunch ladies: young moms looking to earn a little cash while their children attended school; retirement-aged lonely widows whose grandchildren are grown; exasperated older women trying to get away from recently retired husbands, or worse, husbands who had been laid off from long-term careers and possibly robbed of their retirement benefits; fun moms (ME!) and last, complete and total social misfits (also me!) just looking to work 9 months out of the year with few hassles and do whatever weird thing they are into the other 3 months. So you see, children encountered Lunch Ladies that ran the full spectrum of personal commitment to the HAIR NET SOCIETY. I first decided I LOVED being a lunch lady when my boss told me not to EVER help any child, for any reason, acquire food that was not paid for. REALLY? This sounded odd to me but I soon realized what kind of ridiculous pressure school food programs are under to “turn a profit.” The goal really is to meet government standards to maximize the school’s reimbursement potential. Somewhere far down the line is the goal to nourish children’s minds and bodies to encourage and support healthy growth and natural curiosity to learn. “Charlie,” (I can’t possibly remember the child’s actual name), shuffled toward the lunchroom cash register one day wanting to have a second milk. My boss was glaring “knowingly” at me as if to remind me that this was a major “lunchroom offender” of the worst kind: he did not have enough money in his account for a second milk!!!! What’s a compassionate Lunch Lady to do??? What any loving MOM would do. I slipped the kid an extra milk (so what?) and put 35 cents of my own money in the register. Big deal. The next day, “Charlie” did not try the same “trick” again. Instead, he very sweetly whispered in my ear, “Thank you for what you did for me.” Our trusting bond was established! “Charlie’s” body and soul had been nourished (come on, people, kids don’t suddenly become “consumers” when they enter the lunchroom – they are kids and if you aren’t nice to them, within reason, lunch just becomes another set of expectations they have to meet to gain your approval). I knew I was sunk in my total adoration for the children that went through the lunch line when I decided to place a balloon on my cash register station to announce my birthday and encourage hugs from my darling patrons! And hugs abounded that day. So why did I quit this dream job, you wonder? It was not because of the children or the school environment. I think at a certain point it just did not feel fun anymore because of the pressure to make the lunchroom a profitable business. I am not criticizing the school lunch program, I understand it is not all fun and games. School lunchrooms are almost as heavily regulated as hospitals and long-term care facilities. To work there requires a commitment to regulatory standards first and devotion to the “clients” next. That was the wrong order for me. But I will always have my “invisanet” (ew! hairnets are made with actual human hair now for a more “natural” look!) to remind me of the most humbling and fulfilling job I ever had. In short, be nice to your Lunch Lady: there could be an extra corn dog nugget in it for you someday!